I have always been the type of person to try and fail at gardening attempts. I have struggled with cacti, spider plants, aloe, sunflowers, vegetables and more! Apparently, I will not let that deter me! 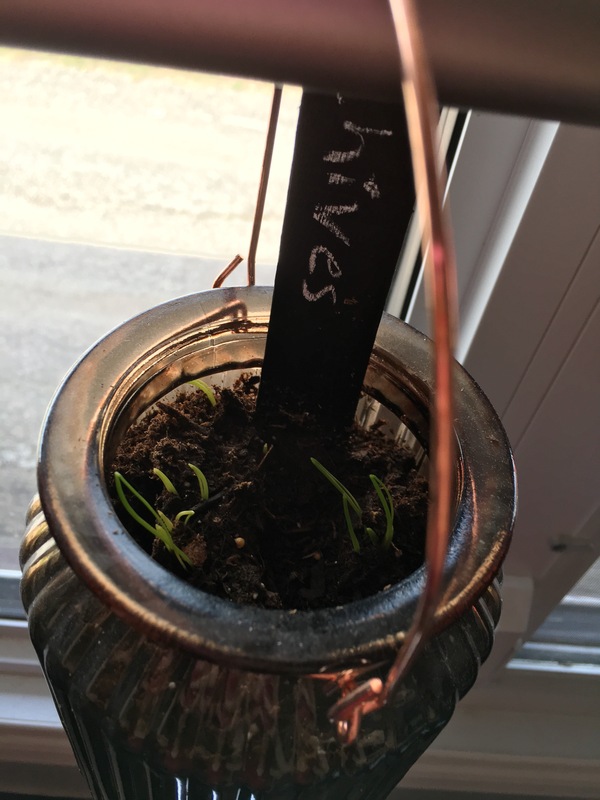 With my upcoming Maternity Leave, I decided that I wanted to have some greenery in my house, so I am attempting a small herb garden in my kitchen window! You should be fearful at this point, because I know I am! Somehow I decided that planting straight from seed was the way to go for this particular venture, and I decided to go with lavender, dill, chives, mint, basil and thyme – mostly because that’s what was available at our very limited Walmart seed selection. Living in the north you can be pretty hard pressed to find all of the varieties of plants/seeds you are looking for, and not all of them will survive in our harsh growing season. This is majority of the reason I decided to plant these herbs inside (the other being I am less likely to forget to water them when they are hanging in my kitchen!). After planting all of the seeds in their respective jars, I painted the craft sticks with chalkboard paint and wrote what each of the jars included. 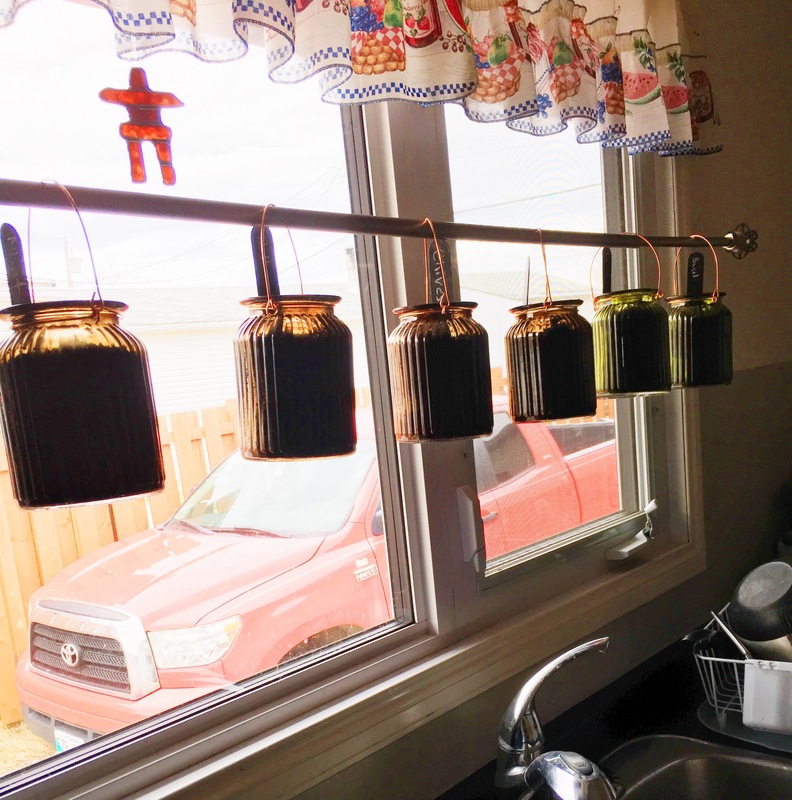 Next, I got Jared to install the curtain rod across the kitchen window, and we strung the jars across the rod. The nice part of the jars is they already had handles on them, so we didn’t have to add rope or anything. 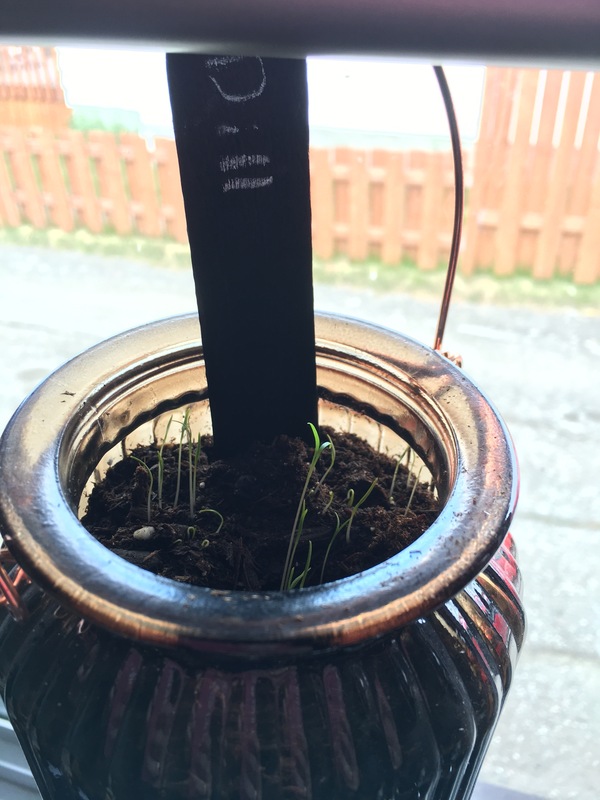 After about a week, dill started sprouting! I was ecstatic! A few days later, chives joined the party!! 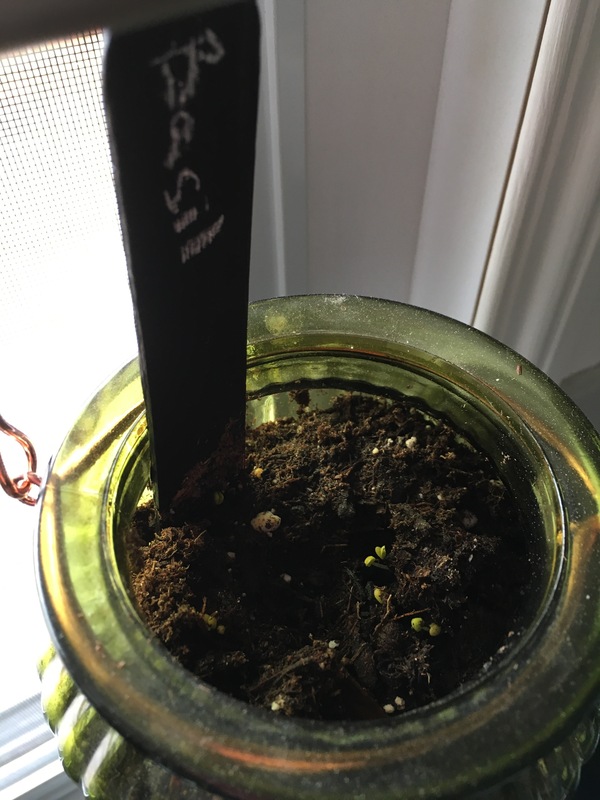 I’m still waiting to see if the rest will sprout, I’ve been told that lavender and basil are difficult, so I’m not sure if they will sprout at all – gardeners! Any tips on these two? EDIT: Basil has little sprouts! Stay tuned for updates! I can’t wait for the potential of fresh herbs to use in my house! Even if just Dill and Chive thrive, they are both we will use!! I’m also working myself up to have hanging ferns and flowers in a few rooms of the house, I figure Maternity Leave is a good of time as any to work on my plant maintenance skills! I can keep Bomber, the baby and the plants alive all at once! Not too daunting if a task – right?? What plants do you love to keep in your house? Let me know in the comments! That is such a cute idea. I cannot wait to see them grow. Thank you!! I am so excited! Fingers crossed they live up to my expectations!